Passion and obsession characterize, too, the long, tortuous path that led to the release of the film that made Elizabeth Taylor a star in 1944. By that time, almost a decade had passed since the publication of Enid Bagnold’s novel and Paramount’s purchasing of the rights, with the intention of turning it into a vehicle for Claudette Colbert or Margaret Sullavan. Scripts had been written, talent searches had been conducted, but National Velvet had never quite made it to the shooting stage. In 1939, MGM took it on, and rumors were rife that John Gilbert’s daughter, Leatrice, would play the lead, but the outbreak of World War II scuttled plans to shoot it on location in Sussex, England, and momentum was lost. It was largely due to interest from producer Pandro S. Berman that the project was revived. He’d originally bid for the rights way back in 1935 when he was at RKO and had the notion that twenty-eight-year-old Katharine Hepburn would be perfect for the role of the feisty, horse-mad Velvet Brown. Fast forward to 1941, and now he was at MGM and still eager to get his pet project realized. It was good timing: he arrived on the lot just as Mickey Rooney’s stardom was in the ascent. As far as Berman was concerned, no actor could be better suited to the role of Mi Taylor, the cynical jockey that helps Velvet achieve her dream of riding her horse in the Grand National. For the ‘role’ of director, Berman identified the versatile Mervyn LeRoy but soon switched to Clarence Brown when LeRoy’s schedule got backed up. As it turned out, Brown was a fortuitous choice as it just happened that he was a master at what W.C. Fields had always advised against: working with children and animals. For the part of Velvet Brown, Berman now had a more age-appropriate star in mind, the exquisite Elizabeth Taylor. She was under contract to the studio and was already getting attention for her roles in Jane Eyre, Lassie Come Home (both 1943) and The White Cliffs of Dover (1943 and directed by Clarence Brown). Taylor’s beguiling looks disguised a formidable ambition and this, along with her fierce devotion to animals, convinced her that she was “born” to play Velvet. She enthusiastically canvassed both Berman and Brown, and later even claimed to have “willed” herself to grow taller to reassure the studio that she had the required physical stamina for the challenging role. Although it seemed that she was a shoo-in, MGM hedged its bets and, in a bid to generate advance publicity, went on a nationwide talent search in early 1943 that yielded…its very own employee, Taylor. With war still raging in Europe, there was now no chance of shooting in Sussex and Brown had to content himself with location work at Pebble Beach in Monterey (standing in for the Grand National’s Aintree), and on the backlot, where a decidedly artificial-looking “English village” was built, complete with half-timbered houses and imitation foliage, and lit by the banks of lights required for the Technicolor photography (by Len Smith). Actress Angela Lansbury, who had been cast as Velvet’s sister, Edwina, remembered it as an “oppressive” set, mainly because of the heat from the lights and the low ceilings of the sets, but also because she found Brown to be something of an intimidating presence (she recalled he was “numero uno…he ruled the set”). Whatever of Lansbury’s reservations, others in the cast flourished under Brown’s direction: veteran Donald Crisp delivered a perfectly-judged comic performance as the Brown patriarch, a man whose authority is perpetually undermined by his entire household, including his pets. All of Brown’s skills at directing children were called upon to guide the relatively inexperienced Jack “Butch” Jenkins in the role of Donald, the youngest member of Velvet’s clan. It was Brown’s second time working with Jenkins—another one of his “discoveries” — and he coaxed a memorable performance from the child: there are striking parallels between it and the “performance” delivered by King Charles, a.k.a. The Pie. Both equine and boy are visually arresting screen presences, forces of nature, mercurial in their moods (in a review of the film, the brilliant Manny Farber observed that Jenkins’ Donald “still seems cut off from this civilization and has been wisely left”). It’s no insult to point out the connections between human and non-human animal performances. because at its heart. National Velvet is all about how we humans relate to the animals that share our world. The callous-yet-charming Donald sees them as beings to collect, categorize, control — the film changed his beloved “spit bottle” of Bagnold’s novel into a specimen bottle in which he amasses helpless insects for further scrutiny — but Velvet, the butcher’s daughter, wins our hearts because of the compassion she shows in her treatment of The Pie. The two encounter each other in a scene that offers a variation of the “boy-meet-girl” of romantic drama: we have the sweeping cinematography, the building-up of tension, the swelling music, but this time the object of love is a magnificent horse, galloping wildly and seemingly impossible to tame. Just as in Brown’s earlier, Of Human Hearts (1937) and his later, The Yearling (1946), where animals are integral to the narrative, albeit as facilitators of human development, it takes a young “uncluttered” mind such as Velvet’s to finally realize that the wildness of the animal is an expression of fear. It is fear, too, that has governed the humans who, to this point, have responded to the Pie with cruelty and violence. In contrast, Velvet (and Taylor) shows fearlessness, compassion and a recognition of the animal as a sentient being. The only “breaking” of the horse comes from the animal himself: Velvet later declares that The Pie would “burst” his heart in his efforts for her. Mickey Rooney, who delivered a very accomplished performance in a role that required tact — after all, his character is a man in his 20s who forms a close relationship with a prepubescent girl —recalls that he expected Taylor to have to imagine all sorts of (human) scenarios to work herself up to the required emotional state for a scene in which Velvet tends to a colic-stricken Pie. As it happened, the tears came easily for the actress, as she simply imagined what it would be like if “her” horse were to fall ill. It’s a shame that Taylor’s considerable talents as an actress have been overshadowed by the glamor and drama of her private life, because in many of her films, including National Velvet, she delivers performances that are instinctual and deeply affective (and effective). 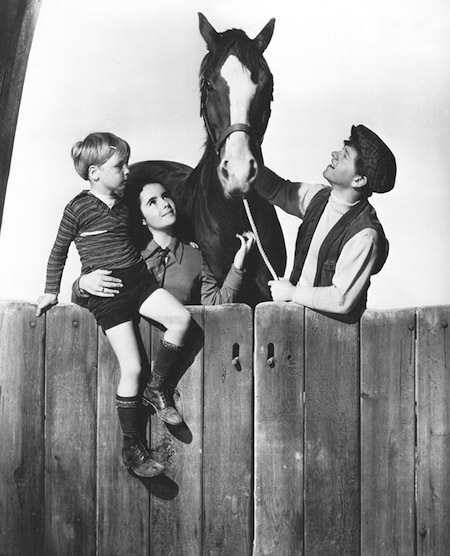 It is easy, too, to disregard National Velvet, to view it as sentimental, maybe even saccharine, product of a bygone era. Yet that would be to overlook its enduring qualities as a work of entertainment and as a study of human emotions. Observe how delicately, and movingly, Brown directs Anne Revere and Taylor in their scenes together, how the relationship between a mother and her daughter is explored without recourse to high drama, “feminine” tensions or discussion of the men in their lives. Instead, this seemingly remote, stern mother lowers her guard to encourage Velvet to follow her dreams and, in doing so, reveals her own ambitions and achievements. Brown paces the scene in a leisurely fashion, all the better to allow the interaction between the two actresses to unfold in a natural, understated way. This scene also returned Brown to a preoccupation that had dominated his work, especially in his collaborations with actresses such as Pauline Frederick, Louise Dresser, Ruth Clifford and, of course, Garbo: his exploration of a world in which women are confined to limited roles, their ambition scorned, their dreams crushed. Cynics may scoff at the seemingly far-fetched plot of a young girl riding a horse to victory in the Grand National, but National Velvet is about the necessity of dreams and dreamers, and it expresses a hope — so pertinent in 1944 but still relevant today — that a world might be forged that can accommodate both. This entry was posted in Books, Guest Posts and tagged clarence brown, Clarence Brown: Hollywood’s Forgotten Master, elizabeth taylor, Gwenda Young author, Mickey Rooney, National Velvet. Bookmark the permalink. 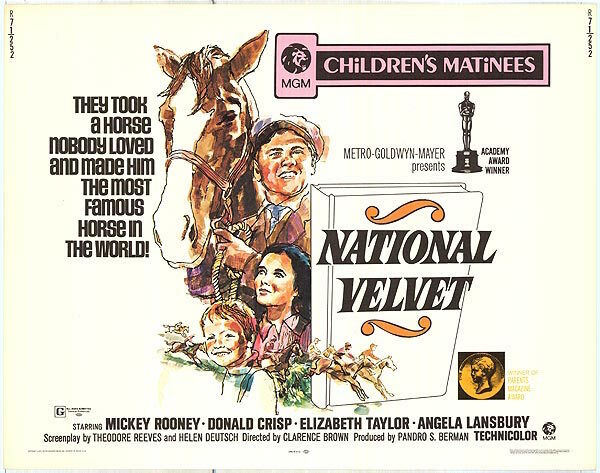 Thank you for this insightful exploration of NATIONAL VELVET. It does suffer in my eyes from the common movie practice of casting beautiful people to play supposedly plain people. My horse-loving daughter read the book as an 8-year old who had recently acquired braces and strongly identified with the brace-wearing heroine of the book, whose looks are never described as anything but ordinary. She naturally then wanted to watch the movie so we rented a video. The disappointment on her face when Taylor showed up on the screen was real.